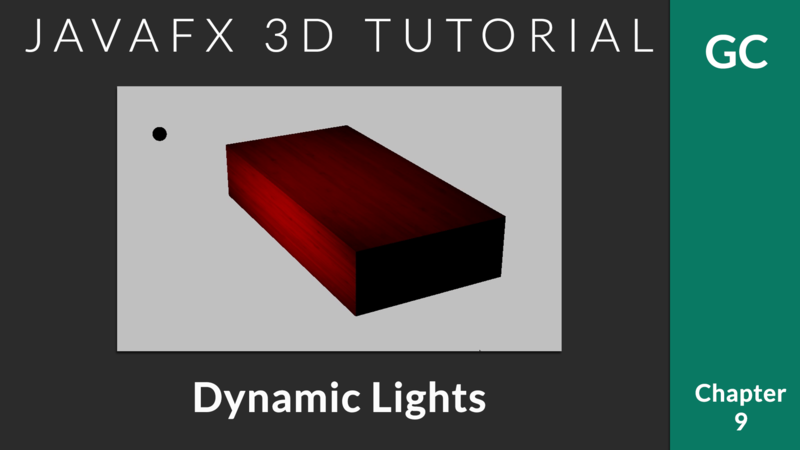 In the last chapter, we saw how to add lights to the 3D scene. In this chapter, we will see how a moving light works. You can add as many lights as you need. To animate the light sources, you can use predefined animations from javafx.animation package like TranslateTransition, RotateTransition etc or custom animations can be applied. In this example, I will write a custom rotation animation to get the following effect. We can create the rotation effect for the light source using rotateProperty. The important thing here is to specify the axis of rotation. We have the freedom to rotate the object in 360 degrees. In this example, I am rotating light source about X Axis. AnimationTimer will be called during each frame rendered. We can update the transform properties of objects to create smooth animation. In this example, I have increased rotation angle of light source by 1 degree during each frame. You can speedup the animation by increasing the value ‘1’ to a higher one. Animation speed can be reduced by reducing the value. //Increase rotation angle by 1 degree during each frame.